Two people are in the hospital following a serious rear-end crash on the Selmon Expressway’s upper deck. Police and witnesses state that a 52-year-old man was riding eastbound near Mile Marker 10 when he slowed down for traffic. But an 86-year-old man, who was trailing the motorcycle, did not slow down. Instead, he collided with Mr. Lanham and then careened into a retaining wall. First responders transported both men to a nearby hospital. At the scene, emergency responders almost always assign fault to the rear-ending driver. Many times, that same result occurs in a Hillsborough County court. But sometimes, there is a difference between fault at the scene and liability for damages. So, regardless of the facts or what the police report says, it’s always important to discuss your rights with an attorney. The last clear chance defense often applies in these cases. Assume for the moment that the first rider mentioned above saw the second driver approaching at a high rate of speed. If that’s true, the first rider had a reasonable opportunity to avoid the crash, perhaps by pulling onto the shoulder. If he failed to do so, the first rider is legally responsible for the crash, even though he is the one who was rear-ended. Motorcycle collisions add an extra dimension to Tampa car crash cases, especially in this specific area. 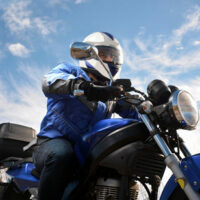 It’s very difficult to perform emergency maneuvers in a motorcycle. So, when considering if a motorcycle rider had a reasonable opportunity to avoid a crash, jurors must take this difference into account. Some people are more familiar with the last clear chance doctrine in the “swoop and squat” insurance fraud scheme that’s so common in Florida. An unscrupulous driver pulls out in front of another driver and then slows down to induce a rear-end collision. The unscrupulous driver is clearly not entitled to benefits, and the last clear chance rule is the reason why. Unfairly many people believe that motorcycle riders are all Hell’s Angels members or they are simply reckless thugs. So, an attorney must deal with these strong feelings when selecting a jury. That’s actually the first way to deal with situations like this. An attorney never tries to use emotionally-charged language like “prejudice” or “bigotry” even if they are appropriate. “Strong feelings” is a much better phrase to use during the jury selection process to expose any bias or prejudice towards the plaintiff’s case. It’s usually very hard to disprove a prejudice, even if it is clearly wrong. Typically, it’s a better idea to separate the victim from the prejudice. It’s all fine and well if the jurors believe that most bikers are thugs. It is only important that they see the victim as an exception to that rule. So, an attorney may be able to introduce evidence about the victim’s family or commitment to the community. There is a lot at stake. Damages in a motorcycle crash trial usually include compensation for economic losses, such as medical bills, as well as noneconomic losses, such as pain and suffering. Additional punitive damages may be available as well, in some cases. When motorcycle crashes and rear-end crashes combine, the issues are extremely intricate. For a free consultation with an experienced personal injury attorney in Tampa, contact The Matassini Law Firm, P.A. Attorneys can connect victims with doctors, even if they have no insurance or money.